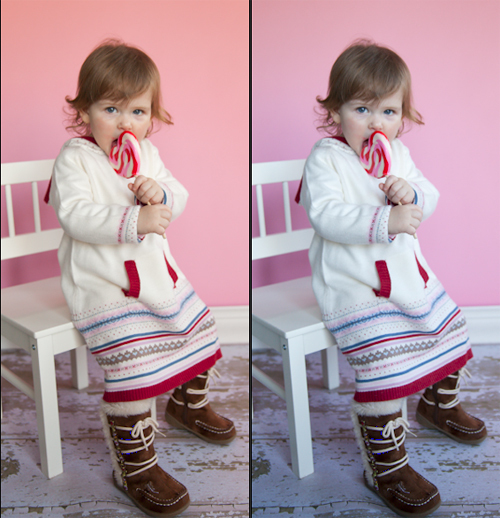 How to use Lightroom (or ACR) to adjust the white balance of your image and then how to check and finetune it in Photoshop. This tutorial uses the CMY % method of correct skintones that I first learned about in Katrin Eismann’s book, but she credits Dan Margules for the theory. It sates that the C value should be 30-50% of the M value, and that the Y value should be 1/5-1/3 higher than the M value. BTW, C=Cyan, Y=Yellow and M=Magenta! In this tutorial I eyeball the correct WB and then check my percentages using the info palette in PS. I then use a color balance adjustment layer to tweak as necessary. You can see from the brief bit of playing I do with the color balance controls how much easier it is to get in the ballpark with just those two WB sliders. As always, post any questions in the comments. PPS: IMPORTANT! In the like 5 minutes since I posted this I have been involved in a discussion where it was pointed out that Katrin Eismann’s #s might be a little heavy on the cyan and that the correct ration is actually C= 1/5-1/3 of the M value. I didn’t want to rerecord the tutorial, but the same technique applies, you would just warm up the image even further in LR or ACR than I did until that C value dropped even more. This is a great tutorial Ariana! I love all your postings. What if I don’t have Lightroom? How should I do this? Maybe it’s a personal preference, or maybe my eye is being pulled too much by the red undies. I’ll do another adjustment layer and add a bit more yellow and drop the magenta. The photo really does look a lot better in B&W though. Ok, so how about non-facial skin tones? I have a shot of a belly (sadly with red under-wear), and it just ALWAYS looks too warm. I used your suggestion (thank you very much) and here’s the comparison: before on top, after adjustment on bottom. Any way to rescue this before having to turn B&W? Hi Ava, I really can barely see a difference in the before and after, the skintones are reading fine for me on both. To my eye MAYBE the after looks a tad warmer, but not much! Are you calibrated? It doesn’t look too warm to me at all. As far as bellies go, I have noticed that even if your WB is correct and you have tweaked the colors so the skintones are correct, the belly may still bee too cool or need less magenta. So, unfortunately you may have to do an additional adjustment layer and mask it so it only shows through on the belly! Thank you so much !! These tutorials help me out a lot. Could you do a post about lenses? What you have and what you use them for? I Love this! :-) Thanks for sharing~!! Samm, no, the grey card is the best way to set correct WB.. this is what I do if I don’t have a gray card as a reference. And even WITH a gray card you still need to check the skin.. It often needs to be adjusted to less magenta. Cool! Thanks! I’ve never heard of this but will try it. I recently got a gray card and have tried that method of correcting. Is there any reason you prefer the CMY % method? Ariana- This is great! I love the videos. I visited a post from March and watched how you run an action. I downloaded some free one’s from Totally Rad, but wasn’t quite sure how to use it. I recently heard of Pioneer Woman and look forward to exploring actions! Thanks so much! You are so helpful! Thanks! One of the simplest explanations I’ve seen! Thanks, I love your tutorials! Is there a way to do something similar inside Photoshop? I don’t have Lightroom. Thanks! LOVE IT! THANK YOU!!!! So glad I found your website!! Long question (sorry). When I load into LR, it is in prophotoRGB colorspace. Then in photoshop I have it set to AdobeRGB. But when it opens in PS (as you did in your video) it asks do I want to leave it in prophoto and I pick to leave it in prophoto because I know it will be popping back into LR. Then, when I export to print from LR I export as sRGB. Do you stay in prophoto too? Do you do sRGB all the way through? Do you import into LR differently? DOES ANY OF THIS MATTER WHEN COLOR CORRECTING? Unfortunately.. no :( LR only gives you the RGB values. It is possible to learn the correct RGB ratios too – I just never got used to it! I hope that CMYK readouts is something they introduce in future versions of LR! Great tutorial, as always — thanks so much! Skin tones are definitely something that I need to work on.